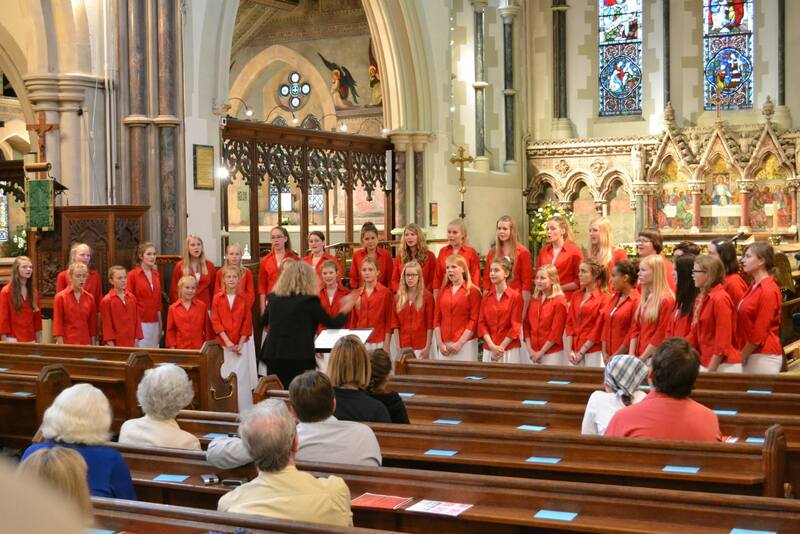 We welcomed the Girls’ Choir of the Musikkonservatorium, Esberg, Denmark, to Christ Church on Saturday 29th June for their first UK concert as part of a short tour. The girls arrived with their conductor Lone Gislinge, their accompanist David Butterworth and a group of Choir Mums and Dads at 5.30pm after a busy day which had begun at 8.00am at the Thamesside Youth Hostel in Rotherhithe and was followed by a trip around the museums on Cromwell Road, giving impromptu concerts on the streets (and even in Nando’s) along the way! They immediately set to work rehearsing – all from memory and unaccompanied! 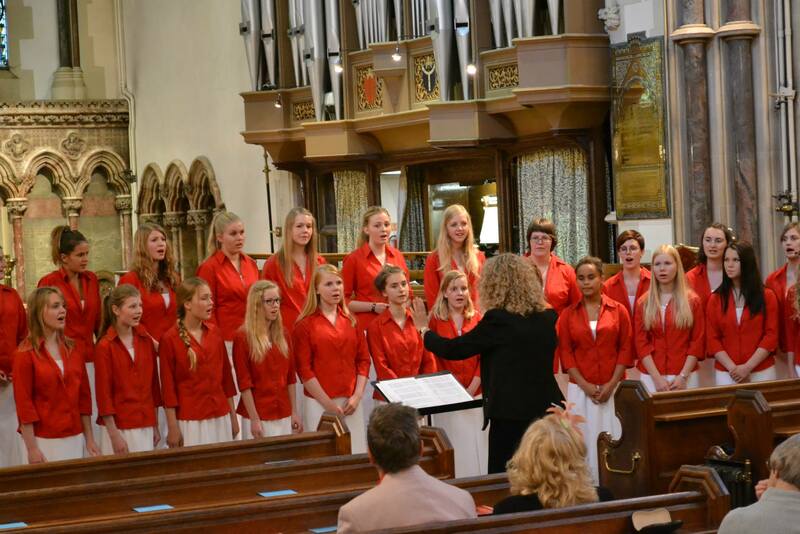 The choir of 35 girls aged between 12 and 19 years, made their entrance at 7.30pm by processing down the aisle in their striking red and white robes, performing a mixture of sacred and secular work, including songs by Danish composers Carl Nielsen, Poul Schierbeck and Niels la Cour. In the first half they also sang pieces in English by Bob Chilcott and John Rutter and the Canadian born composer Rupert Lang, whose setting of Cantate Domino was performed while the choir divided into two lines and gracefully moved from the chancel to encircle the nave, stopping when each singer was standing two or three metres apart – all achieved whilst remaining in pitch and in time; an impressive display of their obvious and considerable talent. After a brief interlude of organ music by David Butterworth, a long time friend of the choir who was responsible for the building of the first two organs in England by the world famous Danish firm of Marcussen and Son, the girls performed a selection of songs from different countries, including Denmark, Finland, the USA and John Farmer’s famous English Madrigal “Fair Phyllis” – oft performed at our own May Day Fair. 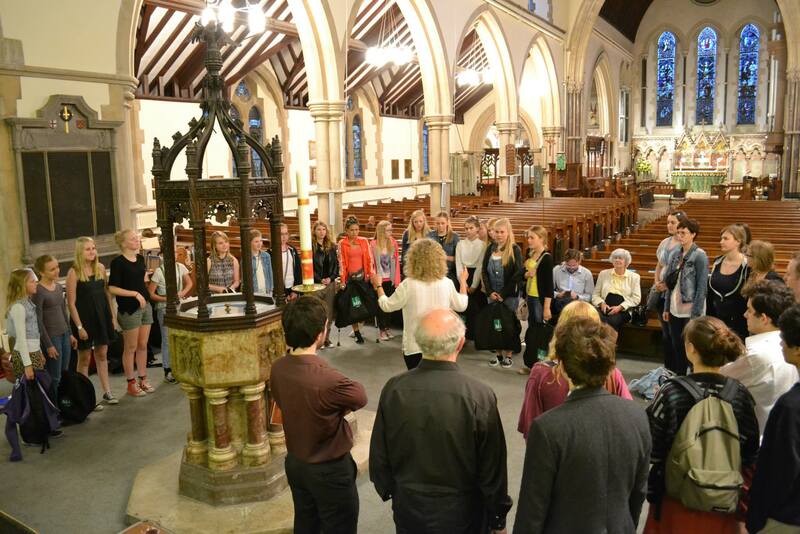 After the concert, the audience was treated to some light refreshments and before the girls left on their coach, we were treated to an impromptu performance around the font! We look forward to welcoming the Boys Choir to Christ Church in October for another concert. An impromptu performance around the font! ← Fine weather brings out bumper crowds to raise thousands of pounds for charity!